William F. Maloney was born in Hartford, Connecticut on May 25, 1921. He entered military service on December 14, 1942 and served with the 508th Parachute Infantry Regiment (PIR), 82nd Airborne Division. In March 1944, as part of the invasion build-up, the 508th PIR was posted overseas. They were based in Nottingham, England, where Maloney had the chance to play baseball before going into combat. On Sunday, May 28, 1944, an enthusiastic crowd of 7,000 fans gathered at Meadow Lane soccer ground to see the 508th Red Devils play an exhibition game against the locally based 505th PIR Panthers. The Red Devils were far superior to the Panthers, winning 18-0. Eight days later, as night fell on June 5, Maloney and the men of the 508th - faces blackened and hearts racing - boarded transport planes for the flight across the English Channel. That night over France, 24,000 Allied paratroopers ascended through the darkness into chaos and confusion. 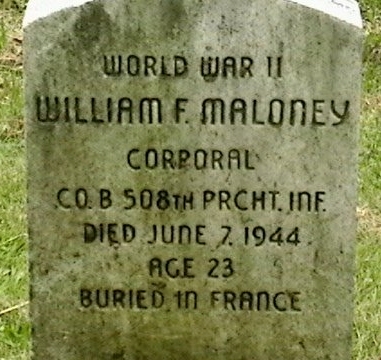 Corporal Maloney was killed in action the following day. He is buried at the American Military Cemetery in Normandy, France, but also has a marker at Soldier's Field, Northwood Cemetery in Hartford. Thanks to Dave Berry at www.pathfinderhistoricalconsultants.com for help with this biography. Thanks also to William Maloney's nephew, Keith Claffey for supplying the correct date of birth and the photo of his uncle's marker at Soldier Field.